Continuing from Part 1 of Pilgrimage to St Anne’s Church. This date marked the actual Feast Day of St. Anne and St. Joachim that falls on July 26, each year. Two English Masses were celebrated, one at 5.30pm while the second at 7.30pm, followed by the procession at 9pm. 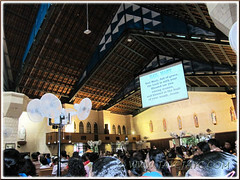 The crowd at St. Anne’s Sanctuary that day, though huge, was not as massive when compared to the 100,000 pilgrims and devotees who attended the Feast Day celebration on Saturday, July 30th, where seven Masses were celebrated to cater to the enormous turnout. What a wonderful day we all had before the evening’s climax at St. Anne’s Church! 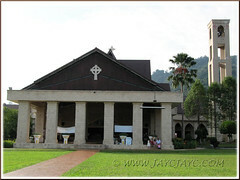 I can still recall us traveling to the Church of Holy Name of Jesus, Balik Pulau from Hotel Grand Continental in Penang, reaching there around noon and was warmly greeted by the Parish Priest, Fr. Martin Thien. After some moments of prayer and worship in the Church, we adjourned to its hall where we had a hearty lunch of Penang Assam Laksa, finger-licking durians and other local fruits. Balik Pulau’s durians and Assam Laksa are simply awesome, to say the least! Thoroughly enjoyed our meal and the company of the friendly and witty Fr. Martin! Then, we left Penang around 2.45pm and headed towards the Church of the Nativity of the Blessed Virgin Mary in Bukit Mertajam. Again, we gathered to pray and worship there, as we usually do whenever we visit any church during our pilgrimage. Fr. Victor Louis, the young-looking Parish Priest graciously served us tea before we continued on our journey to St. Anne’s Church. We arrived at St. Anne’s Sanctuary about 4.40pm. Then, we gathered quickly behind the Shrine of St Anne (the old church) with spirit-filled intention to prayerfully meditate on the 15 Stations of the Cross which outline the main events of Jesus’ passion, death and resurrection. Following the stations erected up the hilly terrain can be quite a strenuous climb to the hilltop. It is not encouraged for those who are having health problems. However, if you’re able, do undertake the uphill ‘journey with Jesus’ along the 14+1 stations to reach the hilltop to experience the tranquility, peace and joy that awaits you up there! For me, there’s a strong awareness of the awesome presence of Jesus and His grandmother, the blessed St Anne, at its peak where the 15th Station and St Anne’s grotto are sited. The 15th Station (depicted with the crucified Jesus on the cross) in fact represents His Resurrection, the glorious end where He is risen from the dead on the third day, at Easter. Reminds me of the Transfiguration of Jesus on the mountain as described in the Bible (Matthew 17:1-9) where the three apostles saw His glorified form. One ground level slightly above and behind the 15th Station is the famous St Anne’s grotto, the historical site of the 1st Chapel of St Anne that was built in 1846 by the French visiting priest, Fr. Adolphe Couellan. 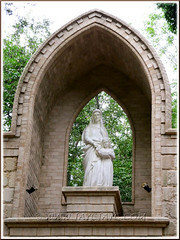 It is alleged that many miracles have occurred at this site over the century and even St Anne’s apparition had been sighted too. Read about the miracle that I had witnessed last year if you are interested. Blessed St Anne saves and leads many to Jesus! 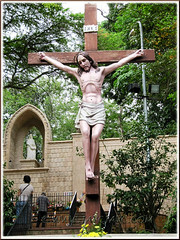 Somehow, I get choked up when praying the Way of the Cross, during my climb uphill and right to the top. Reflecting on Jesus’ sacrificial love and mercy that’s unconditional and unfailing for the whole of humanity and me, will automatically stir me emotionally to remorse and tears. THANK YOU SO MUCH, LORD JESUS, FOR REDEEMING US BY YOUR PRECIOUS BLOOD! HELP ME TO BE MORE LIKE YOU EACH DAY AND EMBRACE YOUR WAY OF LIFE! My darling John, as seen in the left photo was elated to have made it uphill to St Anne’s grotto, in spite of suffering from lumbar spondylosis. Praise and thank the Lord for answering our prayers! A miracle indeed! He climbed up with ease and did not experience any pain at all which was amazing. Entirely different from his previous climb last year where he couldn’t go beyond the 2nd Station. 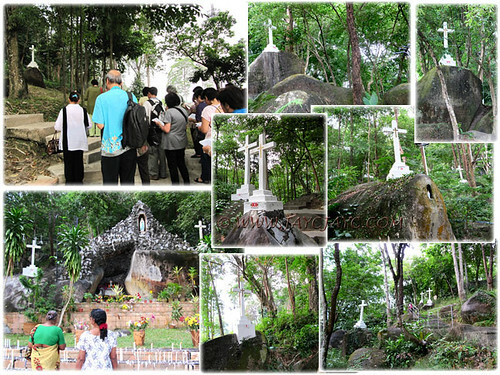 After spending much time in silent prayer at the peak, we came downhill cautiously, pausing in between to capture the various Stations of the Cross in that scenic rainforest-environment. 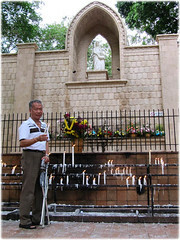 We had ample time to spare before attending the rosary and novena, scheduled at 7.00pm. 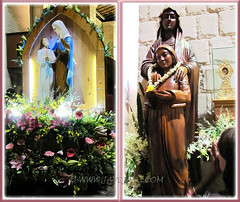 So, I explored the Sanctuary’s grounds to capture three other Stations of the Cross that I had missed out the previous evening. We had time too to enjoy the food and drinks that were generously served by the Church’s team of helpers. This Free Food Project was available throughout the 10-day St Anne’s Novena and Feast Day Celebrations. The setting inside the enormous Church is as impressive as the view outside. It is spacious and can seat about 1,800 persons, even has pews included behind the altar (the rear or back section) which is not the norm. The unique ceiling design truly caught my attention – it is spectacular to say the least! Elsewhere, at specific locations, there are various religious status and mosaic murals to adorn the interior. 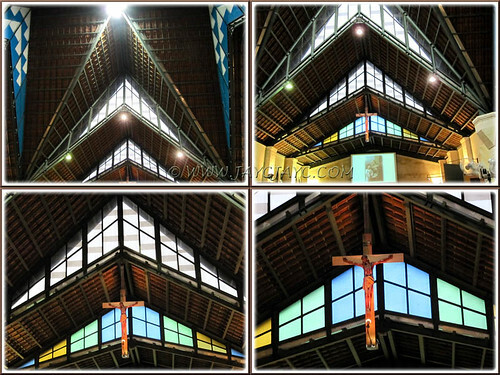 The well-ventilated Church was brightly lit inside and large standing fans were strategically located to keep the place of worship cool and comfy. 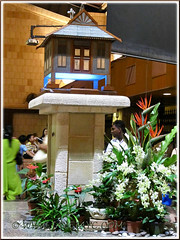 The extreme-left image shows the Minangkabau-designed Tabernacle, truly traditional and Malaysian-bias. The next photo-collage shows the lovely statues of St Anne and her young daughter, the blessed Mother Mary. Beside the second statue to the right, is displayed a glass reliquary with a golden vessel bearing St Anne’s relic (a tiny 300 fragment of her bone) which is revered by Catholics. The main celebrant of the actual Feast Day Mass was Bishop Antony Selvanayagam, the Bishop of Penang and concelebrated with 9 priests. Church was packed with worshipers and overflowed outside to the open corridors, porch and grounds. The theme for the day was ‘My Family and Vocation’. 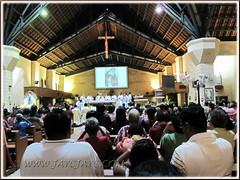 Hence, in his down-to-earth homily, Bishop Selva stressed on the importance of family relationship. He exhorted all present to build families that are rooted in faith and love, in the person of God, to enable each member to live out everyday in love and to churn into relationship of love. Family is the cradle where vocation begins, whether as a father, mother, child, brother, sister, etc. and each has a vocational role to play. Build a holy family, the domestic church – nurture, build and strengthen one another. Die to oneself to be life for one another. Pray always, especially together as a family, to open the door of our hearts and invite Jesus in and listen to Him. God will surely work wonders in your family, he said. After the Mass, Bishop Selva then led the candlelight procession which began at 9pm around the Church’s grounds, followed by the adoration of the Blessed Sacrament and Benediction inside the Church. The whole celebration was well-organized and went along smoothly. Moreover, the weather was perfect. God must have been smiling down on us, delighted with His people’s efforts in giving glory to His Son, Jesus and honouring His blessed grandmother, St Anne! 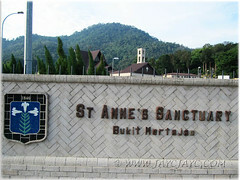 We bade good-bye to St Anne and left St Anne’s Sanctuary in Bukit Mertajam, slightly after 10pm, had supper nearby before traveling back to Hotel Continental in Penang for the night. After a hot bath and some recollection of the day, we hit the sack almost close to 1pm. Though terribly exhausted at day’s end, John and I felt that it was indeed a very blessed and joyful Christ-centered day, and well-spent with our brothers and sisters in our pilgrimage group. God willing, we hope to repeat the 2-day pilgrimage to St Anne’s Church next year. Thumbs up and a big thank you to George Yeow for organizing such a splendid pilgrimage tour. Not forgetting, our grateful thanks to the Church’s Parish Priests, Fr. Henry Rajoo and Fr. Simon Ee and the community of parishioners and volunteers for their fantastic hospitality during the spirit-filled celebrations. 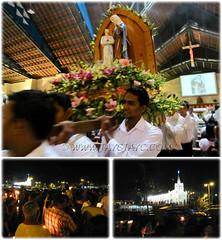 The annual Feast of St Anne that draws pilgrims by tens of thousands from near and far, and celebrated on a grand scale for 10 days, has been listed in the Penang Tourism Calendar! 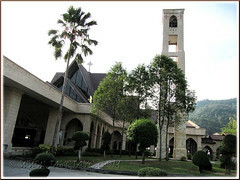 Situated on a 20-acre expanse of lush greenery and rainforest, St. Anne’s Sancturary with its eye-catching Minangkabau-designed Church, monumental Shrine of St Anne, beautiful life-size sculptures at Dataran St Anne and the Stations of the Cross, to name a few, has much to offer, as a center of pilgrimage. 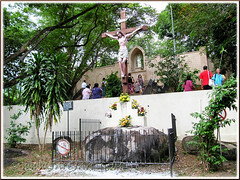 A must visit to St. Anne’s Sanctuary to be spiritually uplifted or simply to de-stress and experience peace and tranquility in its sacred grounds! TO GOD BE THE GLORY, ALWAYS! I will proclaim your faithfulness forever. that your faithfulness is as permanent as the sky. I came to wish you Happy Holidays during the Hari Raya season. May God bless you and your family! Oooh… so sweet of you, A. Belle! Thank you very much, my dear friend. Happy Hols to you too and God’s richest blessings be upon you and your family always!